Many hobbyist cooks underestimate the value of a knife's sharpness. When they first bring a new knife home, they're thrilled with how well it feels and how well it cuts. Six months later, their knives are now dull as a doornail. The cook wonders why they didn't hold up so well and goes off in search of newer, better knives. But wait just a minute there! A little maintenance can go a long way toward preserving sharpness. Do it right and you can extend the life of your knives indefinitely. Learn about maintenance before you buy knives and you can save yourself a ton of money. If you want great performance from your knives, look for knives that are sharp and will remain sharp with proper maintenance instead of ones that are "maintenance free." Most people read this article to learn about sharpening. But, while I've got you, I'll mention three other important factors in knife maintenance: cleaning, storage and cutting boards. We'll start with sharpening, but don't miss those important sections near the end of this page. Sharpening consists of rebuilding the edge on a dull knife. A skilled blade worker can restore an edge that is as sharp, if not sharper, than the blade's original edge. Before we get started on sharpening, though, we've first got to clear up a misconception about 'honing'. Then we'll talk about which sharpening technique you should choose and then finally we'll talk about how to properly sharpen a knife. Honing consists of realigning a usable edge. Sharpening rebuilds a new edge on a worn blade. Many people believe that sharpening consists of rapidly and repeatedly dragging a metal rod across their knife blades. Like many popular perceptions, this is only partially based in truth. That metal rod is called a "sharpening steel" or a "honing steel". The latter is a better name, since it's actually for honing, or refining, a knife blade and not for sharpening it. Every time you use your precision knife, you create minor imperfections and bends in your blade. Any one imperfection doesn't add up to much, but use your knife regularly for a week or two and you'll start to notice the dullness. A honing steel, used frequently -- after every other hour-long session or so -- can help reset these imperfections and keep your knife sharp. Unlike honing, sharpening a knife consists of re-building a new edge on a worn blade. This involves removing a bit of the metal edge to uncover a new, sharper one. Depending on how worn the knife is, more metal may need to be removed. Because metal is being removed from the blade, over-aggressive sharpening can actually reduce the lifespan of your knife. Some novices are scared off by this but, once you've read this guide, you'll be able to make smart decisions about sharpening so that your blades will get sharp and stay that way. Let's talk about some of the different techniques you can use so you can choose the one that best suits you. A few bad electric sharpeners have given the entire group a bad rap. The sawzall on the back of your electric can opener, for example, will eat your kitchen knives for lunch and should be avoided at all costs. High-quality electric sharpeners, however, get the job done and are convenient and easy to use. If you've never sharpened your knives, you'll certainly improve your edges by using a good electric sharpener. Unfortunately, there are a few downsides even with the high-end models. Electric sharpeners generally don't produce an edge that is as refined as the other techniques outlined in this article. Also, many models are overly aggressive when it comes to removing metal, which can reduce the lifespan of your knife. I don't generally recommend electric sharpeners for those reasons. If you've got high-end knives, you won't want to trust them to an electric sharpener. If you've got inexpensive knives that you want to keep sharp, you'd need to buy a sharpener that costs more than your knives! But, if you're convinced you want to go this route, Chef's Choice is the brand to trust. Most people who are serious about sharpening consider stones to be the only way to go. 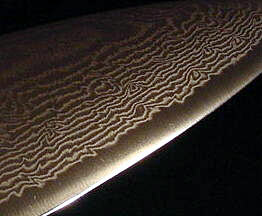 Japanese waterstones are among the most popular types and are available in various coarseness levels -- or grit sizes -- depending on how much work the knife actually needs. Provided you've got the patience to learn proper technique, sharpening with stones allows you to choose an appropriate grit size, sharpening angle and amount of pressure. This will result in the best quality edge once you've refined your technique. Below is a video that introduces proper technique. You may find this is enough to get started but, if not, I recommend Dave Martell's excellent DVD The Art of Knife Sharpening for professional training. Shun makes a combination whetstone that is a good choice for novices. It's not the least expensive stone around but it's readily available and has two grit-levels in one stone, making it an easy choice for an introduction to this technique. Various devices claim to give you the benefit of sharpening with stones without the guesswork of setting your angles. These techniques provide more convenience than stones, and are usually easier to learn how to use. However, they trade off that convenience against inflexibility. Want to use a certain grit that is not available in your system, or want to set a custom angle on your knives? You may be be out of luck if you choose one of these. Pull-through sharpeners hold miniature stones in place at just the right angle and provide a slot for you to insert your knives and pull them through, dragging the edge against the stones. Many provide multiple slots, each one providing a unique level of coarseness. Lansky makes a sharpening system that is worth a special mention due to its popularity. 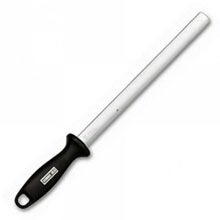 The Lansky system enables you to drag the stone over the knife, rather than the other way around. The system includes an adjustable bracket that ensures the angle is set properly, and a set of stones that can be easily swapped in and out. Sharpening systems can be a good choice for high-quality sharpening without the learning curve of stones. Be aware of the trade-offs involved, though, before committing to this technique. If you've read about the techniques above and decided they may not be for you, professional resharpening can be an excellent option. Sound expensive? It's not. You can typically have a knife resharpened for less than ten bucks. The trick is to find somebody good. You can start by testing out a specialty cutlery shop. If they provide sharpening services, try them out with a few lesser knives to see if they know what they're doing. If they don't, ask them to recommend someone who does. Alternatively you can find sharpeners on the web that will accept and return your knives by mail. These sharpeners cost more, since you'll need to pay for shipping, but you can quickly find some with top-notch reputations and reasonable fees. One of the best is D & R Sharpening. Whether you choose a local or internet-based sharpener, you shouldn't be without your knives for more than a week or so. During that week, I recommend you eat out! Many high-end knives are said to be "stain resistant", "maintenance free", or "dishwasher safe". This means that the steel used in making the blade is durable and corrosion-resistant. Sadly, that construction can often go hand in hand with "dull". Those types of knives might be right for you if you're adamant about never washing a dish or if you like to leave your knives sitting dirty after you've done the food prep. But for those who want high-performance sharp knives, a touch of preventative cleanup is required. Fortunately that cleanup comes down to one simple rule: hand-clean your knives shortly after each use. Knives get banged around in the dishwasher. The chemicals in dishwasher detergent can stain and dull your blades. Instead, simply clean the knife gently, but thoroughly after each use and dry it immediately. High-performance knives should never sit in water -- this is a surefire way to cause corrosion and dullness. How you store your knives is another important factor in how they will perform. Just like with cleaning, it comes down to one simple rule: don't throw them in a kitchen drawer. Knives are jostled around in a drawer, causing the blades to scrape one another. This results in -- you guessed it -- dullness. Better storage options include a wooden knife block or a magnetic knife strip. If you choose a knife block, look for one with horizontal slots so the knife blade won't be touching anything while stored. 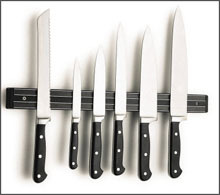 If you opt for a magnetic knife strip, you'll have the added bonus of having your knives on display in your kitchen. Like the look of your knives? Go with the magnetic strip. It should come as no surprise, after reading about knife maintenance, that the surface of your cutting board affects how sharp your blades will be. Opt for wood cutting surfaces over ceramic or glass when choosing a board -- the latter two surfaces can degrade a knife's blade dramatically and quickly. Check out all of our kitchen knife sharpening reviews along with some recommendations.